Valerian and the City of a Thousand Planets is at times a visual treat, a homage to serialized funny books, and a spiritual sequel to The Fifth Element. Valerian and the City of a Thousand Planets is also at times dull, lifeless, and untrusting of its audience. The film opens with perhaps its beast beat. It starts of with mankind greeting each other as they connect their spacecraft together to begin to form a spacestation. Overtime those handshakes start to occur with other species and the City of a Thousand Planets is born – slowly, over-time, and with cooperation. There is a sense of hope and theme in this first section. A theme I wish the rest of the film followed and explored. 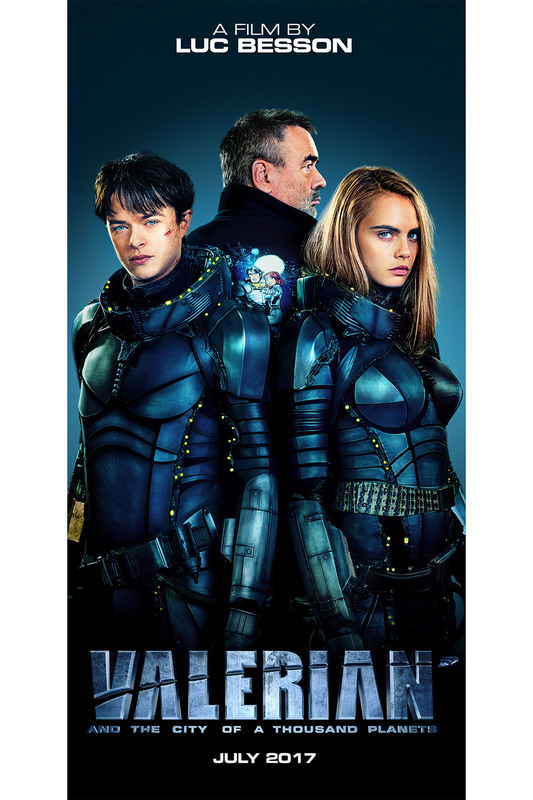 Instead we are introduced to Major Valerian (Dane DeHaan) and Sergeant Laureline (Cara Delevingne), operatives for the Government. Valerian is instantly unlikable and Laureline tries to come off as strong and unaffected by his wiles, but she pushes him away to weakly – not creating space for her own character to grow, but to remain in Valerian’s shadow. The first set piece that takes place in “The Big Market” is actually a really, fun and interesting set piece. Its intricate, alive, and clever. I expected the same from the titular City of a Thousand Planets, but was ultimately left disappointed with the small, mostly service passageways, portions of the city we saw. The second and third act go slowly forward, occasionally doing something interesting and connecting disjointed adventures together to form something of a story. There is also an awkward dance scene with Rihanna’s character Bubble that goes on for far too long. Eventually the characters catch up to where the rest of us are and the movie ends – characters that I can’t say I love pretending to be in love with one another. I wouldn’t say that Valerian and Laureline were miss cast. Dane DeHaan did well with the comedic beats and portraying the recklessness of the character; the charm and confidence though were sorely lacking. Cara Delevingne’s Laureline is also strong and intelligent, her side eye is on point, but as stated before her character is too tied to Valerian and again that confidence just wasn’t there. The rest of the cast just do their thing, not really given anything to work with. I left the theater feeling alright about the film. Luc Besson knows how to direct and especially knows how to make a world fill alive and interesting. Ultimately, the film was neither bad, nor good; it exists in that lukewarm layer of films where a few tweaks could have made this a great film. I would not recommend rushing out and seeing it right now, but if you have a free night and want to see some interesting sights, then rent Valerian and the City of a Thousand Planets. Previous PostPrevious Lego Batman Is THE Batman! Next PostNext Shmee Does A Full Dive With Sword Art Online!